As of 17 November 2016[update], a total of 552 people from 36 countries have reached 100 km (62 mi) or more in altitude, of which 549 reached low Earth orbit or beyond. Of these, 24 people have traveled beyond low Earth orbit, either to lunar orbit, the lunar surface, or, in one case, a loop around the Moon. Three of the 24–Jim Lovell, John Young and Eugene Cernan–did so twice. The three current[when?] astronauts who have flown without reaching low Earth orbit are spaceplane pilots Joe Walker, Mike Melvill, and Brian Binnie, who participated in suborbital missions. As of 17 November 2016[update], under the U.S. definition, 558 people qualify as having reached space, above 50 miles (80 km) altitude. Of eight X-15 pilots who exceeded 50 miles (80 km) in altitude, only one exceeded 100 kilometers (about 62 miles). 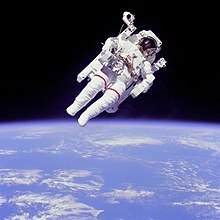 Space travelers have spent over 41,790 man-days (114.5-man-years) in space, including over 100 astronaut-days of spacewalks. As of 2016[update], the man with the longest cumulative time in space is Gennady Padalka, who has spent 879 days in space. Peggy A. Whitson holds the record for the most time in space by a woman, 377 days. In English-speaking nations, a professional space traveler is called an astronaut. The term derives from the Greek words ástron (ἄστρον), meaning "star", and nautes (ναύτης), meaning "sailor". The first known use of the term "astronaut" in the modern sense was by Neil R. Jones in his 1930 short story "The Death's Head Meteor". The word itself had been known earlier; for example, in Percy Greg's 1880 book Across the Zodiac, "astronaut" referred to a spacecraft. In Les Navigateurs de l'Infini (1925) by J.-H. Rosny aîné, the word astronautique (astronautic) was used. The word may have been inspired by "aeronaut", an older term for an air traveler first applied in 1784 to balloonists. An early use of "astronaut" in a non-fiction publication is Eric Frank Russell's poem "The Astronaut", appearing in the November 1934 Bulletin of the British Interplanetary Society. The first known formal use of the term astronautics in the scientific community was the establishment of the annual International Astronautical Congress in 1950, and the subsequent founding of the International Astronautical Federation the following year. By convention, an astronaut employed by the Russian Federal Space Agency (or its Soviet predecessor) is called a cosmonaut in English texts. The word is an anglicisation of the Russian word kosmonavt (Russian: космонавт, Russian pronunciation: [kəsmɐˈnaft]), one who works in space outside the Earth's atmosphere, a space traveler, which derives from the Greek words kosmos (κόσμος), meaning "universe", and nautes (ναύτης), meaning "sailor". Other countries of the former Eastern Bloc use variations of the Russian word kosmonavt, such as the Polish kosmonauta (although Polish also uses astronauta, and the two words are considered synonyms). "Yǔ háng yuán" (宇航员, "Space-universe navigating personnel") is used for astronauts and cosmonauts in general, while "Hángtiān yuán" (航天员, "navigating outer space personnel") is used for Chinese astronauts. Here, "Hángtiān" (航天) is strictly defined as the navigation of outer space within the local star system, i.e. solar system. The phrase "tài kōng rén" (太空人, "spaceman") is often used in Hong Kong and Taiwan. While no nation other than the Russian Federation (and previously the former Soviet Union), the United States, and China have launched a manned spacecraft, several other nations have sent people into space in cooperation with one of these countries. Inspired partly by these missions, other synonyms for astronaut have entered occasional English usage. For example, the term spationaut (French spelling: spationaute) is sometimes used to describe French space travelers, from the Latin word spatium for "space", the Malay term angkasawan was used to describe participants in the Angkasawan program, and the Indian Space Research Organisation hope to launch a spacecraft in 2022 that would carry vyomanauts, coined from the Sanskrit word for space. In Finland, the NASA astronaut Timothy Kopra, a Finnish American, has sometimes been referred to as sisunautti, from the Finnish word sisu. The Soviet Union, through its Intercosmos program, allowed people from other "socialist" (i.e. Warsaw Pact and other Soviet-allied) countries to fly on its missions, with the notable exception of France participating in Soyuz TM-7. An example is Czechoslovak Vladimír Remek, the first cosmonaut from a country other than the Soviet Union or the United States, who flew to space in 1978 on a Soyuz-U rocket. Rakesh Sharma became the first Indian citizen to travel to space. He was launched aboard Soyuz T-11, on April 2, 1984. With the increase of seats on the Space Shuttle, the U.S. began taking international astronauts. In 1983, Ulf Merbold of West Germany became the first non-US citizen to fly in a US spacecraft. In 1984, Marc Garneau became the first of 8 Canadian astronauts to fly in space (through 2010). In 1985, Rodolfo Neri Vela became the first Mexican-born person in space. In 1991, Helen Sharman became the first Briton to fly in space. In 2002, Mark Shuttleworth became the first citizen of an African country to fly in space, as a paying spaceflight participant. In 2003, Ilan Ramon became the first Israeli to fly in space, although he died during a re-entry accident. 438 days is the longest time spent in space, by Russian Valeri Polyakov. As of 2006, the most spaceflights by an individual astronaut is seven, a record held by both Jerry L. Ross and Franklin Chang-Diaz. The farthest distance from Earth an astronaut has traveled was 401,056 km (249,205 mi), when Jim Lovell, Jack Swigert, and Fred Haise went around the Moon during the Apollo 13 emergency. The first civilian in space was Valentina Tereshkova aboard Vostok 6 (she also became the first woman in space on that mission). 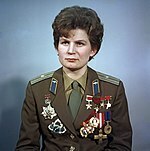 Tereshkova was only honorarily inducted into the USSR's Air Force, which did not accept female pilots at that time. 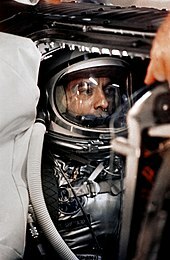 A month later, Joseph Albert Walker became the first American civilian in space when his X-15 Flight 90 crossed the 100 kilometers (54 nautical miles) line, qualifying him by the international definition of spaceflight. Walker had joined the US Army Air Force but was not a member during his flight. The first people in space who had never been a member of any country's armed forces were both Konstantin Feoktistov and Boris Yegorov aboard Voskhod 1. Astronauts in training must learn how to control and fly the Space Shuttle and, it is vital that they are familiar with the International Space Station so they know what they must do when they get there. Mission Specialist Educators, or "Educator Astronauts", were first selected in 2004, and as of 2007, there are three NASA Educator astronauts: Joseph M. Acaba, Richard R. Arnold, and Dorothy Metcalf-Lindenburger.Barbara Morgan, selected as back-up teacher to Christa McAuliffe in 1985, is considered to be the first Educator astronaut by the media, but she trained as a mission specialist. The Educator Astronaut program is a successor to the Teacher in Space program from the 1980s. A 2006 Space Shuttle experiment found that Salmonella typhimurium, a bacterium that can cause food poisoning, became more virulent when cultivated in space. More recently, in 2017, bacteria were found to be more resistant to antibiotics and to thrive in the near-weightlessness of space. Microorganisms have been observed to survive the vacuum of outer space. On November 2, 2017, scientists reported that significant changes in the position and structure of the brain have been found in astronauts who have taken trips in space, based on MRI studies. Astronauts who took longer space trips were associated with greater brain changes. 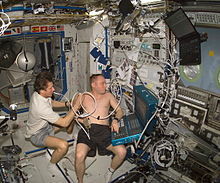 Being in space can be physiologically deconditioning on the body. It can affect the otolith organs and adaptive capabilities of the central nervous system. Zero gravity and cosmic rays can cause many implications for astronauts. A recent study by Russian scientists published in April 2019 stated that astronauts facing space radiation could face temporary hinderance of their memory centres. While this doesnt affect their intellectual capabilities, it temporarily hinders formation of new cells in brain's memory centres. The study conducted by Moscow Institute of Physics and Technology (MIPT) concluded this after they observed that mice exposed to neutron and gamma radiation didn't impact the rodents’ intellectual capabilities. An astronaut on the International Space Station requires about 0.83 kilograms (1.83 pounds) weight of food inclusive of food packaging per meal each day. (The packaging for each meal weighs around 0.12 kilograms – 0.27 pounds) Longer-duration missions require more food. ^ Cheng, Kenneth (March 27, 2015). "Breaking Space Records". New York Times. Archived from the original on June 28, 2015. Retrieved June 28, 2015. ^ NASA. "Peggy A. Whitson (PhD)". Biographical Data. National Aeronautics and Space Administration. Archived from the original on May 9, 2008. Retrieved May 13, 2008. 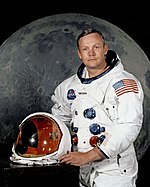 ^ "TheSpaceRace.com – Glossary of Space Exploration Terminology". Archived from the original on January 5, 2008. Retrieved December 28, 2008. ^ Katarzyna Kłosińska, University of Warsaw (16 December 2016). "Astronauta a kosmonauta". PWN. Retrieved April 6, 2019. ^ Mike Gruntman (2004). Blazing the Trail: The Early History of Spacecraft and Rocketry. Reston, VA: AIAA. p. 326. ISBN 9781563477058. ^ реконмендовать другому (October 13, 2005). "Ян Ливэй – первый китайский космонавт, совершивший первый в Китае пилотируемый космический полет" [Yang Liwei, the first Chinese astronaut who has made China's first manned space flight] (in Russian). fmprc.gov.cn. Archived from the original on September 29, 2007. Retrieved October 4, 2007. ^ "太空人 : astronaut... : tài kōng rén – Definition – Mandarin Chinese Pinyin English Dictionary – Yabla Chinese". ^ MTV Uutiset (November 1, 2009). ""Sisunautti" haaveilee uudesta Suomen-matkasta". MTV3. Retrieved April 10, 2018. ^ NASA (2006). "Sally K. Ride, PhD Biography". NASA. Archived from the original on October 16, 2007. Retrieved October 4, 2007. ^ "Educator Features: Going Out for a Walk". NASA. Retrieved November 27, 2015. ^ NASA (1985). "Rodolfo Neri Vela (PhD) Biography". NASA. Archived from the original on October 27, 2007. Retrieved October 4, 2007. ^ Nolen, Stephanie (2002). Promised The Moon: The Untold Story of the First Women in the Space Race. Toronto: Penguin Canada. p. 235. ISBN 978-0-14-301347-1. ^ "NASA – Astronauts in Training". 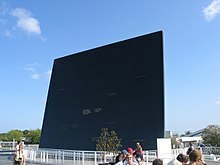 www.nasa.gov. Denise Miller: MSFC. Retrieved 2018-04-03. ^ Chang, Kenneth (January 27, 2014). "Beings Not Made for Space". The New York Times. Retrieved January 27, 2014. ^ Mader, T. H.; et al. (2011). "Optic Disc Edema, Globe Flattening, Choroidal Folds, and Hyperopic Shifts Observed in Astronauts after Long-duration Space Flight". Ophthalmology. 118 (10): 2058–2069. doi:10.1016/j.ophtha.2011.06.021. PMID 21849212. ^ Puiu, Tibi (November 9, 2011). "Astronauts' vision severely affected during long space missions". zmescience.com. Retrieved February 9, 2012. ^ Kramer, Larry A.; et al. (March 13, 2012). "Orbital and Intracranial Effects of Microgravity: Findings at 3-T MR Imaging". Radiology. 263 (3): 819–827. doi:10.1148/radiol.12111986. Retrieved March 14, 2012. ^ "Soviet cosmonauts burnt their eyes in space for USSR's glory". Pravda.Ru. December 17, 2008. Retrieved April 25, 2012. 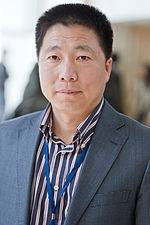 ^ Fong, MD, Kevin (February 12, 2014). "The Strange, Deadly Effects Mars Would Have on Your Body". Wired. Retrieved February 12, 2014. ^ Howell, Elizabeth (November 3, 2017). "Brain Changes in Space Could Be Linked to Vision Problems in Astronauts". Seeker. Retrieved November 3, 2017. ^ Caspermeyer, Joe (September 23, 2007). "Space flight shown to alter ability of bacteria to cause disease". Arizona State University. Retrieved September 14, 2017. ^ Dvorsky, George (September 13, 2017). "Alarming Study Indicates Why Certain Bacteria Are More Resistant to Drugs in Space". Gizmodo. Retrieved September 14, 2017. ^ Cherry, Jonathan D.; Frost, Jeffrey L.; Lemere, Cynthia A.; Williams, Jacqueline P.; Olschowka, John A.; O'Banion, M. Kerry; Liu, Bin (2012). Feinstein, Douglas L, ed. "Galactic Cosmic Radiation Leads to Cognitive Impairment and Increased Aβ Plaque Accumulation in a Mouse Model of Alzheimer's Disease". PLoS ONE. 7 (12): e53275. Bibcode:2012PLoSO...753275C. doi:10.1371/journal.pone.0053275. PMC 3534034. PMID 23300905. ^ Roberts, Donna R.; et al. (November 2, 2017). "Effects of Spaceflight on Astronaut Brain Structure as Indicated on MRI". New England Journal of Medicine. 377 (18): 1746–1753. doi:10.1056/NEJMoa1705129. PMID 29091569. ^ Foley, Katherine Ellen (November 3, 2017). "Astronauts who take long trips to space return with brains that have floated to the top of their skulls". Quartz. Retrieved November 3, 2017. ^ YOUNG, LAURENCE R. (1999-05-01). "Artificial Gravity Considerations for a Mars Exploration Mission". Annals of the New York Academy of Sciences. 871 (1 OTOLITH FUNCT): 367–378. Bibcode:1999NYASA.871..367Y. doi:10.1111/j.1749-6632.1999.tb09198.x. ISSN 1749-6632. ^ Griffin, Andrew (October 2, 2018). "Travelling to Mars and deep into space could kill astronauts by destroying their guts, finds Nasa-funded study – Previous work has shown that astronauts could age prematurely and have damaged brain tissue after long journeys". The Independent. Retrieved October 2, 2018. ^ BioMed Central (November 22, 2018). "ISS microbes should be monitored to avoid threat to astronaut health". EurekAlert!. Retrieved November 25, 2018. ^ Singh, Nitin K.; et al. (November 23, 2018). "Multi-drug resistant Enterobacter bugandensis species isolated from the International Space Station and comparative genomic analyses with human pathogenic strains". BMC Microbiology. 18: 175. doi:10.1186/s12866-018-1325-2. ^ "Radiation can impact astronauts' memory temporarily: Here's all you need to know | Health Tips and News". www.timesnownews.com. Retrieved 2019-04-10.